Jeff Thelen took his Janesville, Wisc., team to the American Legion World Series in 1989. He did so with a regular season ERA of 0.26, according to The Los Angeles Times. In the second round of the World Series against a Southern California Woodland Hills team, though, Thelen took the loss. He had a bad half inning that included giving up a triple, The Times wrote. "I made three or four mistakes in the whole game," Thelen told The Times afterward. "The triple was a perfect example. I look in at the sign with an idea of what I want to throw and end up saying, 'Well, OK, I'll throw that instead.' I'm not saying I threw it half-heartedly, but maybe I threw it tentatively." 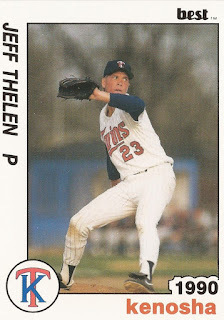 Thelen pitched in that American Legion season after being taken by the Twins in the 8th round of the draft out of Craig High School in Janesville. He first hit the field for the Twins in 1990, at single-A Kenosha. He ultimately played four seasons as a pro. He never made AA. At Craig High in 1989, Thelen was thought of as the best high school pitcher in the state, according to The Milwaukee Journal. He pitched 10 innings in a June game, striking out 14, but took the loss. With the Twins, Thelen got into 28 games, starting 17, at Kenosha in 1990. He ended with a 3-9 record and a 4.80 ERA. For 1991, he returned to Kenosha. He improved his ERA to 3.17 over 26 outings, 23 starts. But his record on the season ended at 5-12. Thelen moved to high-A Visalia for 1992 and then high-A Fort Myers for 1993. His ERA ended at 5.10 in Visalia. At Fort Myers, in just 10 outings, it hit 6.75. His time at Fort Myers was his final time as a pro.